I am trying to get a Windows 10 virtual machine inside Hyper-V to automatically login (without any lock screen or user password input). There are similar questions on SU about doing this in Windows 10, but I believe that the Windows 10 build 10586.545 may require some additional registry changes. This is a clean Windows 10 build 10586.545 install. I ran netplwiz as shown in the image below, unchecking the checkbox "Users must enter a user name and password to use this computer". I also tried changing options in registry. What I get is that the Windows lock screen still appears and I am prompted for a password. What I expected was that Windows would let me automatically sign in, and that I would get directly to the desktop of windows (not the lock/login screen) when I watch the system boot up in the Virtual Machine Connection window. I have verified that I entered the password and username correctly in the automatically sign in dialog which appeared. Update: My VM spontaneously updated to build 14393 (from build 10586.x) and the problem remains. I also tried AutoLogon sysinternals tool, and that doesn't work either. Update: It wasn't what I expected. Hyper-V Virtual Machine "Enhanced" Connection really actually means it makes an RDP connection to the VM. This interferes with the user observing the real root session since the Hyper-V Virtual Machine Connection works via RDP, if Enhanced is on. I found it confusing, because I had forgotten this fact, that Hyper-V when it shows you the "screen" of your virtual machine is not in fact, giving you a glimpse of some hardware VGA driver buffer (the "real" monitor of the virtual machine) but is instead, by default, using an Enhanced integration. The enhanced integration in windows vmconnect.exe in essentially uses the same technique as Remote Desktop client for Windows (mstsc) uses. This causes users like me to think that the autologon feature isn't working, but in fact it is working. In order to observe the VM logging in on its own, turn off Hyper-V Enhanced Session from the View menu of your Virtual Machine Connection (vmconnect.exe) window. Not the answer you're looking for? Browse other questions tagged windows-10 auto-login or ask your own question. 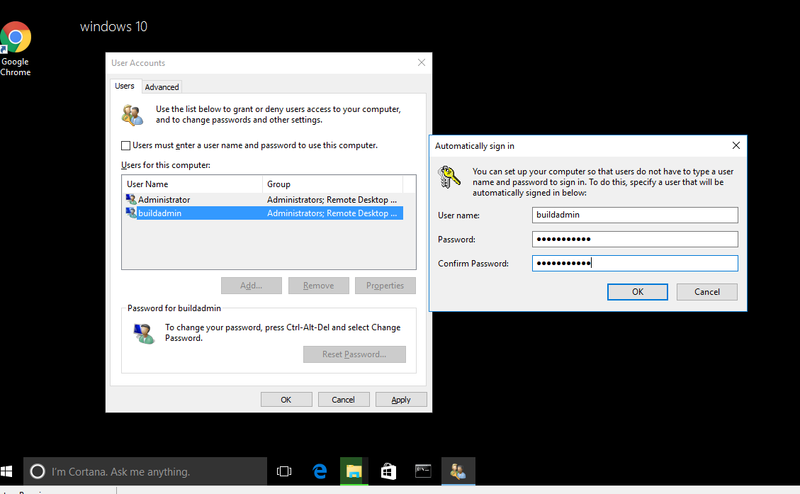 Can you make Windows 10 auto-login one specific user? Is it possible to get a Windows XP SP3 Hyper-V virtual machine properly working on Windows 10 Pro? Windows 10 — how to remove a user from logon screen?